CHUCKY CREATOR BRINGING SCREEN USED CHUCKY! Kevin Yagher is credited with creating the animatronic Chucky doll in the CHILD’S PLAY films and will be bringing a screen used Chucky to Frightmare! Kevin is the creative force behind Kevin Yagher Productions Inc. (KYPI), a forerunner in providing high-end special makeup effects for the entertainment industry. He worked on the makeup for Freddy Krueger in A NIGHTMARE ON ELM STREET 2, 3 and 4, and, shortly after his work on CHILD’S PLAY, he was approached by the producers of HBO’s TALES FROM THE CRYPT to design and build the show’s host, the Crypt Keeper. Kevin also directed all of the show’s wraparounds and several promotional spots, one of which earned him an Emmy. LOWER BERTH, an episode he directed, went on to receive Cable ACE Award nominations for directing, makeup, screenplay and photography. KYPI has collaborated with many top film directors as well as with several well-known actors including Robert DeNiro, Denzel Washington, Mel Gibson, Gene Hackman, Johnny Depp, Robert Downey Jr., Nicolas Cage, John Travolta, Christopher Walken, Dana Carvey, Nick Nolte, Keanu Reeves, Christian Slater and Charlize Theron. KYPI has also worked with Tom Cruise on the blockbuster film, MISSION IMPOSSIBLE 2. Other projects include Paramount’s THE SPIDERWICKE CHRONICLES, FACE/OFF and SLEEPY HOLLOW, Sony Pictures’ MASTER OF DISGUISE and ADAPTATION as well as Universal’s THE HULK. On the film SLEEPY HOLLOW, not only did Kevin write the screen story and co-produce the project, but he also did all the makeup effects including the gruesome decapitations and the headless horseman’s makeup. He went on to receive a Hollywood Makeup Guild Award for his work. Recently, KYPI completed 12 seasons on the hit show BONES. Over the long successful run various effects and props were constructed, from animals, like a deer and a black bear, to every decomposed victim. Also, thousands of skeletal bones were created to show different murder evidence etched onto their surfaces. Kevin Yagher will be appearing both days. KAREN BARCLAY ADDED TO FRIGHTMARE! Catherine Hicks is known for her role as Karen Barclay in Child’s Play. She also had notable roles in 7th Heaven, Ryan’s Hope, her Emmy-Award-nominated performance as Marilyn Monroe in Marilyn: the Untold Story and as Dr. Gillian Taylor in Star Trek IV: the Voyage Home. Catherine Hicks will be appearing both days. LEGENDARY COMPOSER HEADED TO FRIGHTMARE! Maurizio Guarini is a musician and composer, mostly known as a part of the band Goblin. Since the mid 70’s, Goblin has been a reference point for soundtracks of horror and thriller films. The band composed several iconic scores for classics such as Suspiria, Dawn of the Dead, Contamination, Buio Omega, as well as most of the movies directed by Dario Argento. Outside of Goblin, Maurizio collaborated in other horror movies. His synths are the sound of many classic Lucio Fulci movies like City of Living Dead, The Beyond and Zombie. Over the past several years, Goblin has reunited after decades and started touring around the world, bringing their unique sound on stage in Europe, Japan, Australia, New Zealand and finally North America, where the band toured four times in the past five years. In 2013, Maurizio released a solo album, “Creatured from a Drawer”. Recently, Maurizio worked on several soundtracks and scores for spoken word pieces, while still touring, both with Goblin and as a solo musician. In 2017, Maurizio started a new project performing a live soundtrack to the silent movie Inferno from 1911. Maurizio is currently working on several studio albums. Maurizio Guarini will be appearing both days. RARE DUAL JASON PHOTO OP! Join C.J. Graham and Steve Dash as they participate in a rare in costume photo op together inside Jason’s Kill Shack! Don’t miss this once in a lifetime opportunity to get a pic with the the masks behind cinemas most prolific killer!  The Kill Shack returns to Frightmare in the Falls with a twist! Locked in the Cellar Creations is creating “Jason’s Kill Shack” – disgust your friends with a fun photo op with Pamela Voorhees’ shrine! PART VI’S JASON IS STALKING YOU! C.J. Graham was spotted as a potential Jason Voorhees for Friday the 13th Part VI: Jason Lives when he was playing Jason in a night club act, impressing the casting people who were in search of a new Jason since the current Jason actor Dan Bradley wasn’t coming across as imposing or powerful as they had hoped for. C.J. played Jason in all scenes and stunts except for the Paintball scene which they had already filmed with Bradley which marks the third instance of 2 actors portraying Jason in the same film. Graham reprised this role in the video for Alice Cooper’s “He’s Back (The Man Behind The Mask)”, which was written for and featured in the film which blends footage from the film with some new footage. As of 2017, Graham has only played one other role – he appeared in the horror film Highway to Hell as the main antagonist, a heavily made-up, silent monster called the Hell Cop. He has been known to speak highly of his time as Jason, even claiming that he would reprise the role in another film if asked. C.J. Graham will be appearing both days.